With the development of the internet, our lives become simpler and easier. Amazon is the famous site that contributes to the growth of our social. 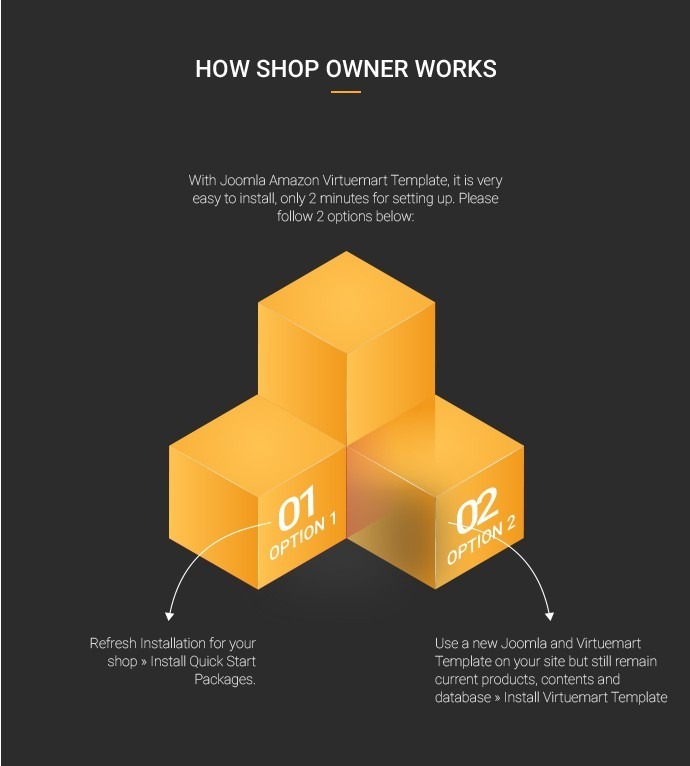 Many customers want their site looks like as Amazon and that a reason while we create Joomla Amazon Virtuemart Template. 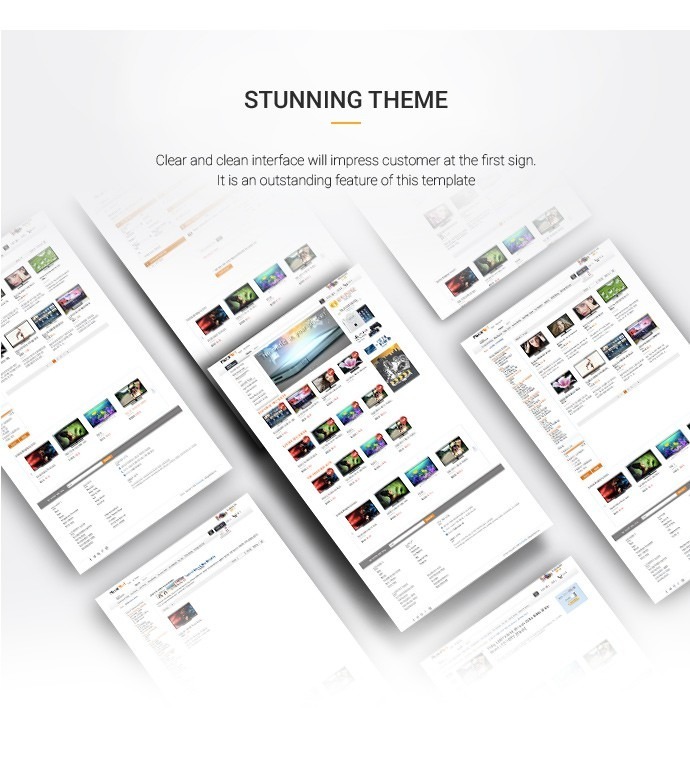 Its design is very beautiful and easy to use for all customers. Therefore, it brings a big value for you when using a product. 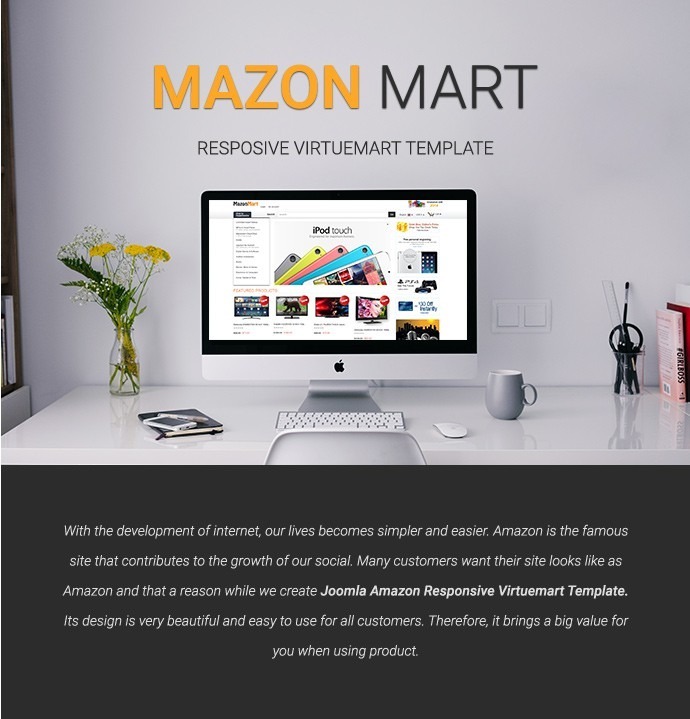 Amazonmart Virtuemart template is integrated with powerful functions such as featured products, top sale products, vertical scroller, Ajax add to cart, dropdown shop carts, images cloud zoom with the light box. All of them will make your site look more attractive and highly recommended by customers thanks to its convenience, steadfast quality and fast speed. Your site will active smoothly with all version of Joomla, Virtuemart. 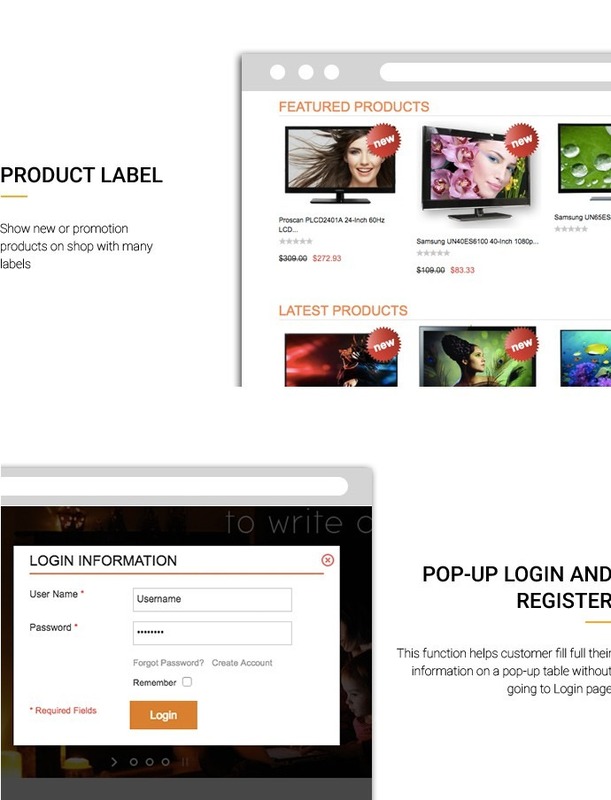 Built-in LESS CSS 3, HTM 5 and JQUERY and on our developer experience so you can be sure about the activity of your site. 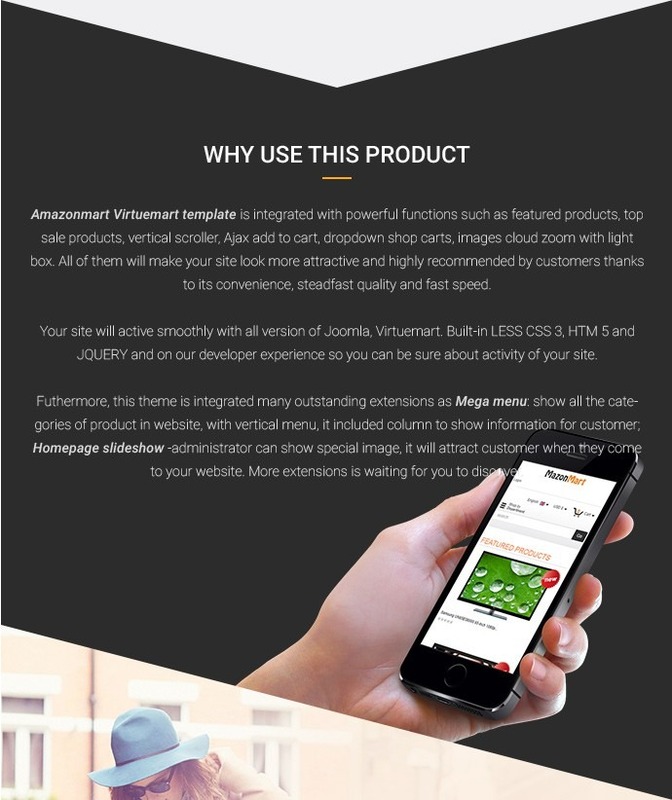 Furthermore, this theme is integrated many outstanding extensions as Mega menu: show all the categories of product in the website, with the vertical menu, it included the column to show information for the customer; Homepage slideshow -administrator can show the special image, it will attract customer when they come to your website. More extensions are waiting for you to discover. 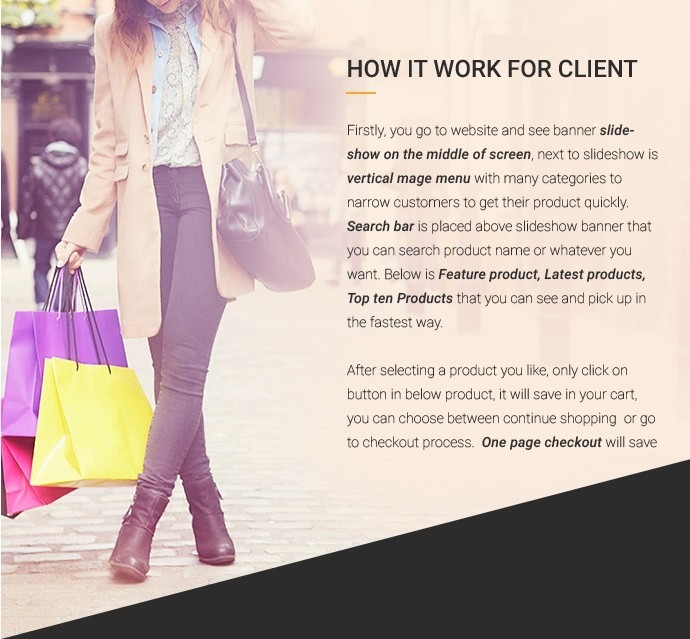 Firstly, you go to the website and see the banner slideshow in the middle of the screen, next to slideshow is the vertical mega menu with many categories to narrow customers to get their product quickly. 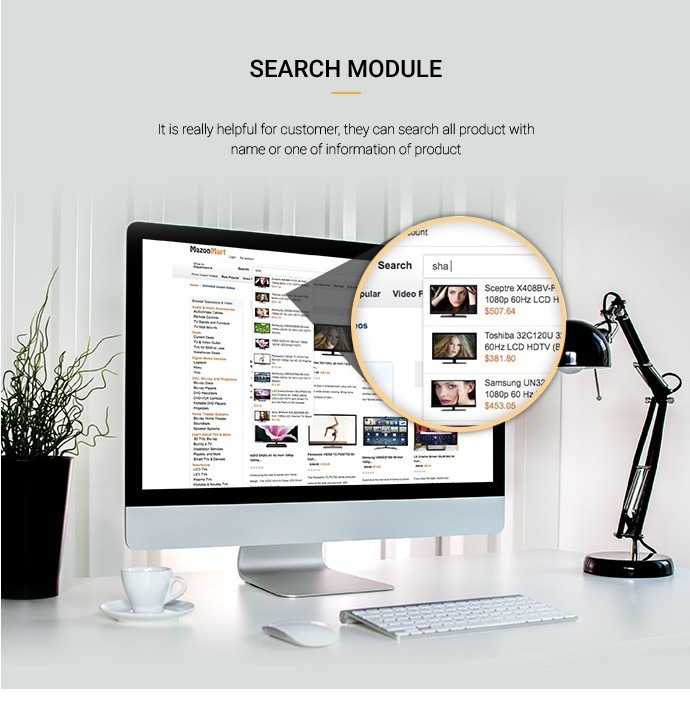 The search bar is placed above slideshow banner that you can search product name or whatever you want. Below is Feature product, Latest products, Top ten Products that you can see and pick up in the fastest way. After selecting a product you like, only click on the button in below product, it will save in your cart, you can choose between continue shopping or go to the checkout process. One page checkout will save time customer time and increase sales volume up to 70%. 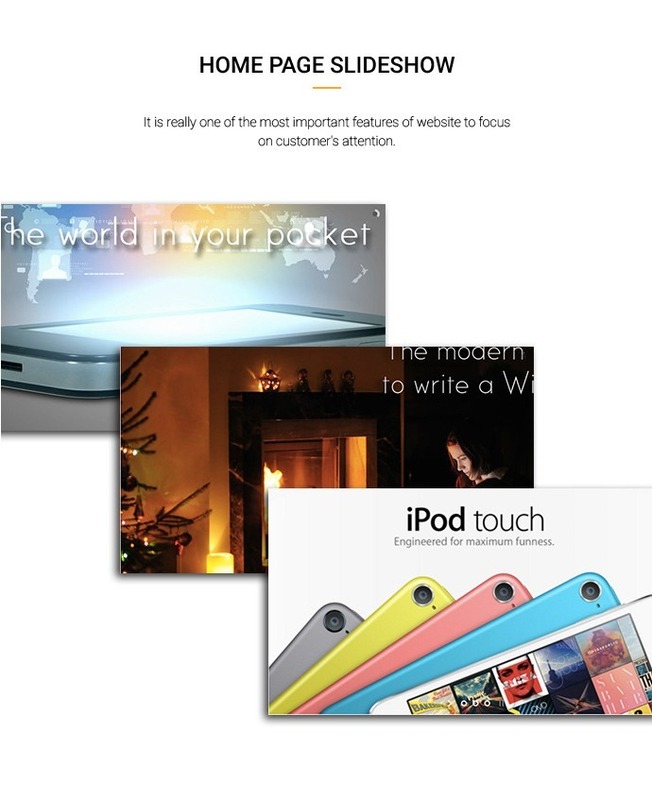 Responsive: Your website will fit all screens from large desktop to smartphone. It looks beautiful on any device. 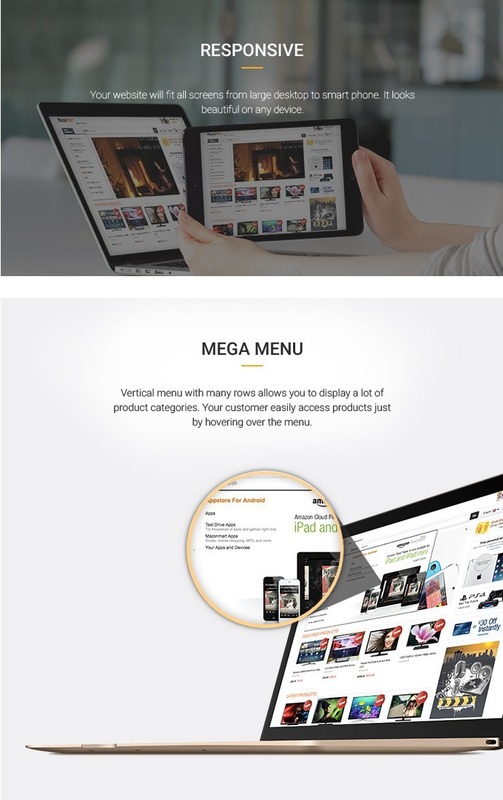 Mega menu: Vertical menu with many rows allows you to display a lot of product categories. 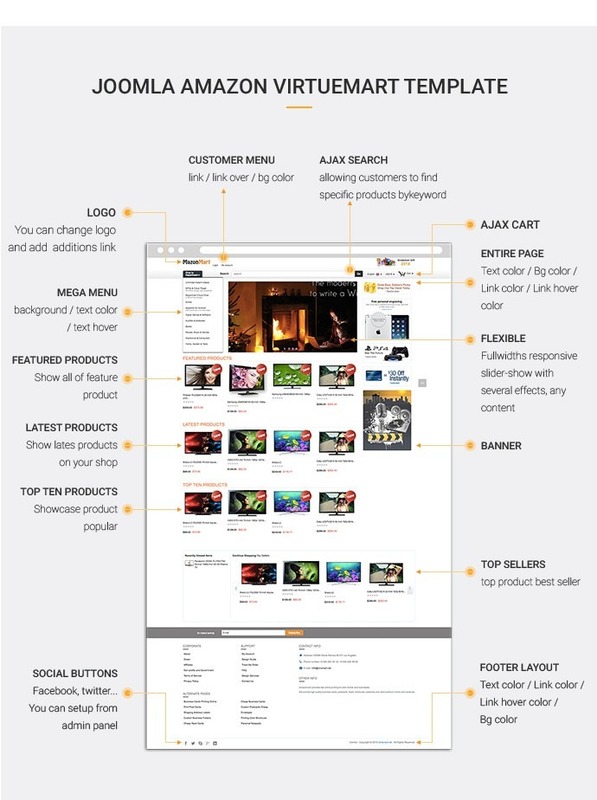 Your customer easily accesses products just by hovering over the menu. 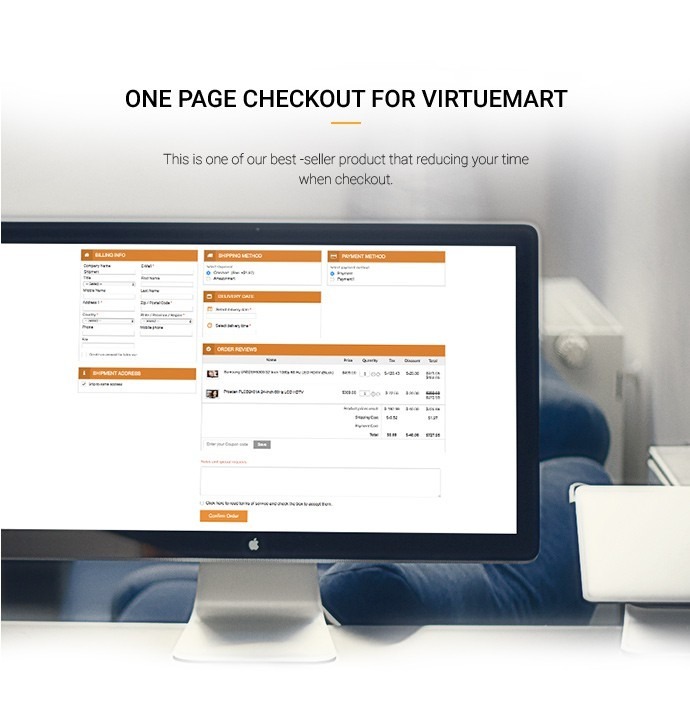 One page checkout for Virtuemart: This is one of our best -seller product that reducing your time when checkout. 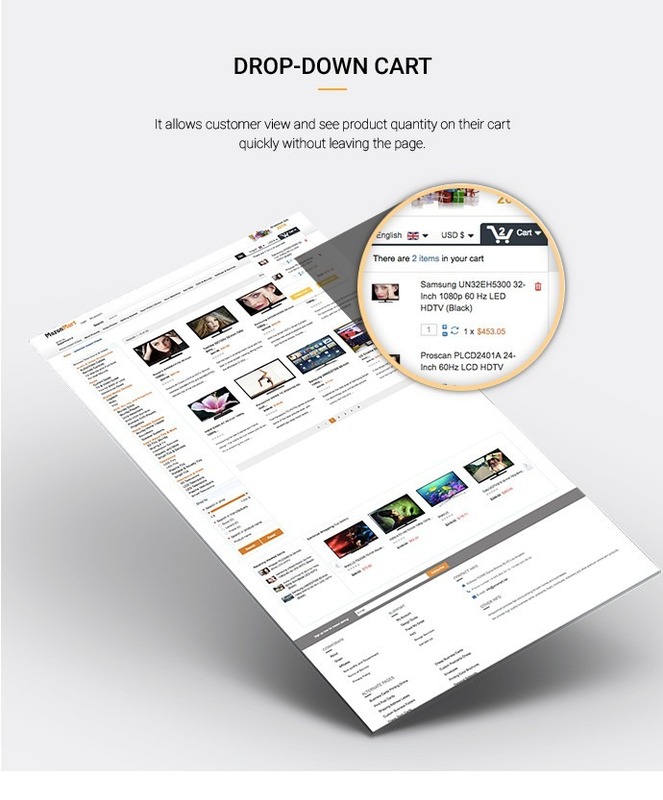 Drop-down cart: It allows customer view and sees product quantity on their cart quickly without leaving the page. Homepage slideshow: It is really one of the most important features of the website to focus on customer's attention. Support cross-browser: Work well on all browsers: Firefox, Chrome, Safari, Opera and Internet Explorer 8 and 9. 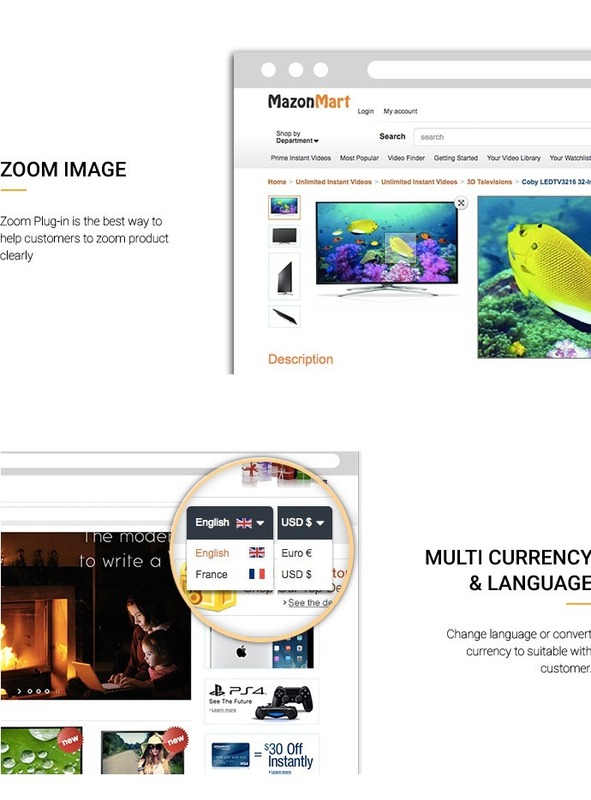 Multi-currency & language: Change language or convert currency to suitable with a customer. 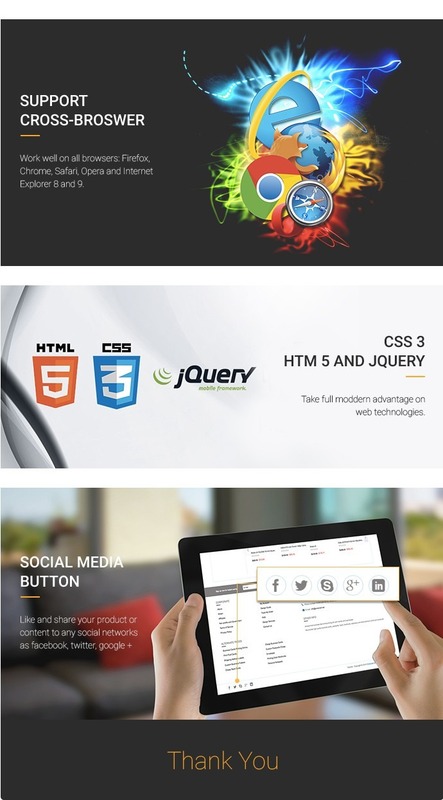 CSS 3, HTM 5 and jQuery: Take full moddern advantage on web technologies. I buy this template for my own store and I'm completely satisfied. This template make my site look more attractive. 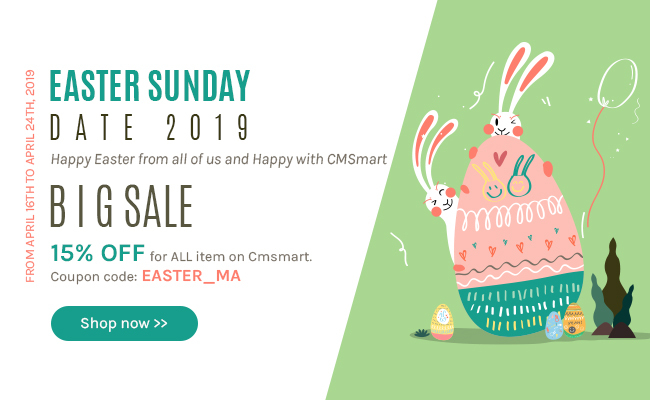 And i had a lot of help and support from Cmsmart team. Thank you so much!